Are you tired of living with the challenges and embarrassment of missing teeth? You have come to the right place. At Four Town Dental, we embrace the latest advancements in dentistry to deliver world-class services. We believe that you should benefit from the best, which is why we offer the most preferred solution to treat tooth loss with dental implants in Enfield. No matter if you are missing one tooth or all your teeth, we will help you regain a beautiful, confident smile. A dental implant is a small cylinder, usually made of a titanium alloy, that gets placed beneath the gum line in a minimally invasive surgery. It serves to replace the root of a missing tooth. Implants are placed strategically so that as few as possible are used to provide the support for the artificial teeth that will go on top of them. Patients may receive anywhere from one implant (for minor tooth loss) to ten or more if they require full-mouth reconstruction. Sometime after implants are placed, our team provides strong, natural-looking artificial teeth to go on top of them. After your consultation, you will be scheduled for an oral surgery to have the dental implant post placed into the jawbone. In some cases, you may need additional procedures prior to starting this process, such as tooth extractions or bone grafting. After the post has been placed, you will spend the next several weeks healing to allow the jawbone to fuse to the post. Once adequate healing has occurred, you will have an abutment attached to the post to connect the custom-made dental restoration. Now that your smile is complete, it is best to maintain your home oral hygiene habits and regular appointments for a cleaning and checkup. With a proactive approach to your dental health, you will help to ensure that your new results last. Since they bond with the bone around them, they help to preserve the bone’s density and mass. Dental implants are successful in over 95% of cases. Complications are rare, and many people remark that the entire process was easier than they anticipated. Often, there is no need to modify or extract any of the remaining natural teeth during the implant process. 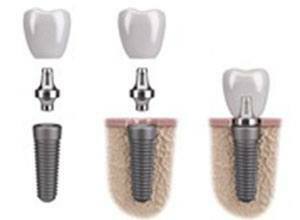 Implants are the most natural-looking and natural-feeling tooth replacement option. 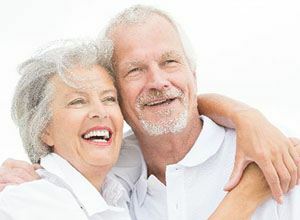 Dental implants have the potential to last a lifetime. The restoration on top of them may last for a decade or longer. As long as you stick to good habits and are careful to protect your implants and their restorations, you’ll find that maintaining your new smile is easy. 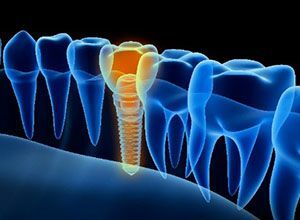 Implants provide the strongest bite force out of all tooth replacement options. Whether you are missing one tooth, a few teeth, or have suffered extensive tooth loss, dental implants may be an appropriate solution for you. If you are only missing one tooth, we may suggest that you receive a single crown to go on top of a single dental implant. For individuals who have several missing teeth in a row, an implant-supported bridge could be the right treatment option. These bridges typically consist of two dental implants and their accompanying crowns. Between the crowns are suspended pontics (artificial teeth) that finish filling in the empty space in the mouth. If you are missing all or most of your teeth, an implant-supported overdenture may be the perfect way to regain your smile. These removable dentures are supported by several implants that are placed at strategic locations throughout the jawbone. They snap onto the implants, providing a strong bite and reliable fit. If you are ready to stop living with the challenges of tooth loss, it is time to schedule a consultation with Four Town Dental. We are eager to answer all of your questions about the process for, benefits of, and cost of dental implants in Enfield. We will create the treatment plan you need to love your smile and attain improved oral health.